Everything that we want in life comes at a price. Today, I spent $10 at Target because I needed some soap and conditioner for my hair. I drop money at the gas station so I can fuel my car. And I pay money each month so the government doesn't come after me for defaulting on student loans. Money is important and it's necessary. I need a salary to pay my rent. I need to budget to pay my groceries. The second episode of Suits this season was titled "Compensation," and while the title is clearly in reference to monetary compensation that Donna is owed by Louis (since Harvey used to pay part of her salary), there's a larger theme at play in this episode and it's the notion that everyone in life has an idea of what they're owed and of how much they're worth. Louis believes he's owed the same respect that Harvey gets as a senior partner. Mike believes he's owed the chance to stand up for the underdog. Rachel believes she's owed the opportunity to enter marriage with Mike without having to sign a pre-nup first. Everyone deserves recognition. Everyone deserves compensation. The question of the hour is... how much do these people really deserve and are they getting too little or too much of it? We play a bit of a back-and-forth game in "Compensation," where Louis wants to smack down a proposal in a meeting in order to make it look like he's defending Harvey. Then Harvey and Louis have an actual verbal spat. Then Harvey makes up with Louis, but not before Louis -- having been slighted -- went behind Harvey's back and made sure everyone at the firm knew how much he made. Oh, and then Louis has a change of heart but it's too late -- the deed is already done. Though the title of this episode has to do with monetary compensation, the episode really isn't about that, at its core. Yes, Donna's salary has been paid by Harvey in part since she came to the firm. That was the deal he made with Jessica. That's the reason he makes more: he contributes more to the firm but he also needs that money to supplement Donna's income. And Louis nearly has a meltdown when he realizes how much Donna makes. Because he has a choice. He can pay her what she's been making or he can... well, not. And this is where everything gets complicated. Because Harvey is still dealing with the loss of Donna. He's a little better than he was last week, but not much. He ends up hiring a new secretary -- a snarky, wonderful older African American woman named Gretchen (played by Aloma Wright, known to me as Laverne on Scrubs) after seeing the parade of model-esque candidates. Gretchen is very good at her job. VERY good. So much so that she notes almost immediately exactly why Harvey chose to hire her to replace Donna instead of one of the other women. Harvey cuts her off, but here's the unspoken line: he's doing it because he doesn't want another young, beautiful secretary. He had a beautiful secretary who he loves and he doesn't want to jeopardize the chance for her to come back to him. While she's gone, Harvey's determined to not screw up their relationship any further (which he inadvertently does in this episode but we'll talk about that momentarily). So he hires Gretchen because he's still in love with Donna. Debate in the comments and disagree with me all you would like, Aaron Korsh, but that's my theory and it's a pretty solid one. So throughout "Compensation," Harvey is still finding it difficult to adjust to a new relationship with Donna. And he's taking all of his grief (remember how this progresses? Anger is around the corner and we saw some of it this episode) out on people like Louis. Because Louis is an easy target for Harvey: he's the person who Donna is now working for and also... Louis is a pretty easy person to blame because he has the tendency to screw Harvey over quite often. (LIKE HE DOES IN THIS EPISODE!) Harvey hasn't processed all of his grief yet but even he knows when he's crossed a line. So he apologizes to Louis. And Louis returns by trying to undo the damage he already did behind Harvey's back. It's a recurring theme with Louis, really. It's not even so much of a recurring theme anymore as just a pattern of behavior. The episode ends with a giant confrontation between Harvey and Louis. It's quieter than the verbal spat they had earlier, but no less intense. Because Harvey calls out something in Louis that I noted in one of my reviews from last season: Louis thinks he's won. He thinks that life is just a series of competitions between him and Harvey. And that's a fault of Louis'. His behavior is a product of his insecurity. So when Louis boasts that he has everything Harvey had: money, Donna, and a name on the door, Harvey astutely points out Louis' greatest flaw. The problem with wanting more is that the moment you get everything you want is the very moment it can all be ripped away from you just as quickly. That's what Harvey tells Louis. He informs him that now... now he thinks he has it all. 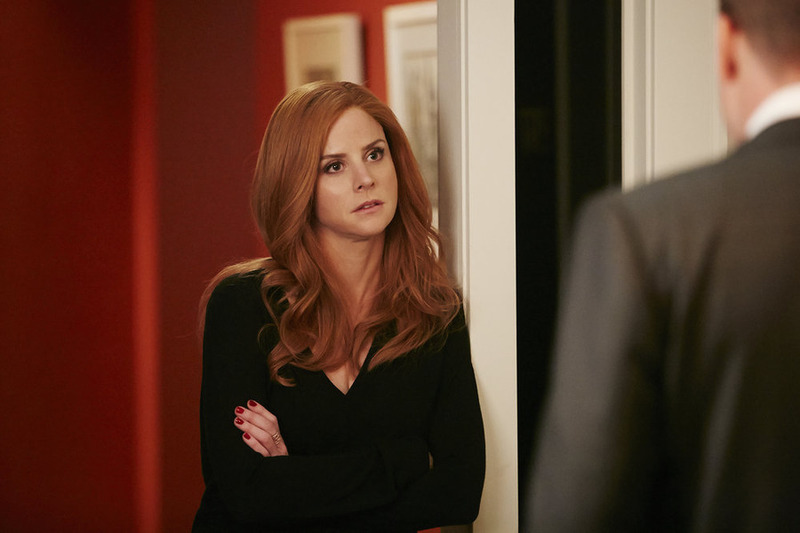 But, lowering his voice, Harvey makes this threat to Louis: Donna WILL return to him. And he'll relish the day he gets to watch Louis lose the very thing he's bragging about having. Louis has always been insecure and his insecurities are what drive him to do maddeningly shrewd and unwise decisions. He's not necessarily a bad person. He's not a villain, in most instances. He's simply the younger sibling, wanting his parents to pay him attention and willing to get that attention (good or bad) no matter what the cost. Does Louis genuinely care about Donna? Yes, absolutely. But does he care about having her as something to hold over Harvey more? Yes. Louis has always wanted Harvey's respect. That's the thing he has sought more than anything else on this show. He wants his name on the door, but he doesn't just want that. He wants everything that comes WITH that: the success and the friendships and the ease and comfort. The life luxurious. The admiration. The reason that Louis isn't admired is because of episodes like "Compensation," where he wants to turn on Harvey so he can get what he wants. Where he's willing to sacrifice something meaningful for something selfish. And then Harvey does something because I think the idea of loyalty sets him off -- he tells Donna why Louis did what he did. He tells her about how he paid her salary for twelve years. That leaves Donna floored and upset because that is the first time he's ever told her what he did for her. Quite frankly, the fact that he did it in the context he did is what sets Donna off. She tells Harvey off and shuts her apartment door. And it's wonderful. Because this is just another tiny fissure in their relationship. I know, I know, you might think it's weird that I'm championing for more cracks in Harvey/Donna. But what I'm really championing for is HONESTY in their relationship. And since they don't have that at the moment because Harvey still cannot be honest with the HALF A DOZEN PEOPLE -- SOME OF WHOM ARE TOTAL STRANGERS -- ABOUT HOW HE FEELS REGARDING DONNA, they need to have their relationship broken down to its most basic components before it can be reconstructed on a solid foundation. Does that make sense? I tried to keep the building metaphor intact. The Harvey/Donna/Louis story in "Compensation" was less about actual money and more about the forms of compensation we often overlook -- respect, honesty, and loyalty. I'm anxious to see where the rest of the story takes us this season because even though things look bleak for Harvey/Donna, he's not giving up on getting her back. He's in it for the long haul and Louis should prepare himself for that. Rachel's father, Robert, wants her to get a pre-nup. Initially she presumes this is because he wants to control her -- wants to control the money she'll eventually inherit from him once he's gone. But this episode's B-story teaches us that love and control are two entirely different things. Trust is a huge part of one and not the other. Meanwhile, this episode finds Mike working on a case where he would need to take on a huge insurance company after a woman's husband died (he was told that his chest pains were nothing, that he was fine, and was sent home only to die in his sleep). Mike is the defender of the underdog, but no one at the firm supports him or the case. Jessica doesn't want to back it. His old boss doesn't want to back it. But there is one person who agrees to not just back the case but tackle it with him: Robert Zane. For all of his faults -- and they are numerous -- Robert had the chance to see the kind of man that Mike is in this episode. He saw his value. He saw him as more than the guy who was going to marry his daughter. And THAT is why Robert chose to take the case with Mike. Respect and knowledge are the currency in their relationship. GOD BLESS JESSICA PEARSON: VOICE OF REASON. Literally, she didn't have a story this week but smacked truth into both the A and B-storylines and for that I am so very grateful. What a character. "Compensation" chose to not just focus on how much money each character deserved, but WHAT each character deserved. Did they deserve respect? Did they deserve honesty? Did they deserve loyalty and trust? Suits doesn't always provide easy answers to complex questions, but that's really good. I'm just glad they ask the questions in the first place. I think MVP for this episode goes to Gina Torres because she absolutely stole every single scene she was in. Her threatening to smack both Harvey and Louis made me laugh so hard. She was exactly everything she needed to be in this episode and I love her for that. "So can we enjoy the rest of our dinner together?" "We can try." Oh, awkward family dinners. HAROLD RETURNED IN WHAT WAS PERHAPS THE GREATEST SCENE IN SUITS HISTORY. It's awkward and painful to watch Donna and Harvey get off the elevator together and then walk to separate offices. I say it again: Harvey is still so in love with Donna that he literally eliminated any possibility for him to screw up and be tempted to sleep with his secretary. I MEAN. REALLY. "It's time to move on from this topic right now." Oh Harvey. You need to deal with your feelings. Let other people help you, dangit. "This is right up your alley: Do-Gooder Lane." Jessica's white dress with the embellished low v-neck was gorgeous and probably costs like, three months of my salary but I want it. "... Am I not manly?" "Well, if you have to ask..." I think I love Gretchen. No, wait. I don't think. I KNOW. "You got lucky." "Lucky?" "Like a monkey who won the lottery." "The problem with always getting more is the second you get it, it can always be taken away." Well, there you have it friends and readers! What did you think of this episode? I can't say I loved it more than the premiere because that was a great episode. But I definitely thought it set up some really good elements for the remainder of the season (Robert/Mike working together, Gretchen, Louis and Harvey's relationship, etc.) Hit up the comments below with your thoughts on "Compensation"! Firstly....Harold! Yay! They need to find away to bring him back for good because he is hilarious and a guaranteed laugh every time he's on screen. I'm looking forward to Gretchen having some interactions with Mike, Rachel...and of course, Donna. I was thrilled to hear today that USA has ordered a Season 6, what a relief. Hello there anon! First of all, thank you for commenting. I seriously think we need to interject Harold into like, every single scene possible because he's hilarious. Definitely some needed levity to the seriousness of this show. Yay, I'm glad we get a sixth season. Hopefully we keep the momentum going until then! In this article Gabriel Macht says that if Donna and Harvey ever get together for him it will be the end of Suits. Reading this makes me very disappointed. What makes a show a good show in my opinion is character development. Even though we are getting a lot of that right now in Suits i feel like Harvey and Donna being together on screen would actually be a fantastic way for them to develop emotionally. And I am a little saddened to realize that we may never get to see that on screen because I have a feeling that is exactly what is going to happen : they will drag out this harvey/donna thing forever until the end of the series and that will become incredibly annoying. I mean writers could provide a lot of amazing story lines if they put them together also...Bones is a great example of how that would work out, if anyone has ever watched Bones. I just really think it would be great character development to see them together! Anyways what do you guys think about that? Gabriel is totally wrong, because what will happen is that people will get tired of them eventually, and whatever happens with them in the end won´t make sense and won´t be believabable. They will destroy what they built and that possibility really really saddens me. I can´t talk much about the episode as I haven´t seen it yet. Hello there lovely anon #2! Thanks for linking that article to me. You know, it's hard -- I don't know what the showrunners and writers are going to do. I can definitely see them waiting until the final episode to do anything with Harvey/Donna (that's literally what just happened with Jeff/Annie on Community). But honestly I think we're on a better path toward Harvey/Donna getting together than we were for those two. Dan Harmon didn't have any sort of build-up for the Jeff/Annie "resolution" so it didn't feel earned (still a great scene: https://www.youtube.com/watch?v=bYJWZnwi6uI) though. I don't know what Aaron Korsh plans on doing with Harvey and Donna but I don't think Gabriel Macht knows either. I think that the fear there is the tropey "Moonlighting" curse on television where the moment you get two characters together with chemistry, suddenly the chemistry is gone. The will-they-won't-they dissipates and nothing is exciting for them anymore. I've seen a LOT of great comedies manage to make this work but I think it's the fear of it not working that prevents the showrunners from even trying. And i kinda also agree with Silvia, i feel like Gabriel and Sarah want to delay kissing eachother or something as much as possible. Maybe Donna and Harvey would have been together by now if they were played by different characters. Who knows! Why? You said like you feel Gabriel and Sarah want to delay kissing eachother or something as much as possible. They didn't like each other or what, because I'm sure as hell they have great chemistry together. I know this show isn't about relationship, and I'll be still watch, even if Harvey and Donna never get together, but come on, they have Mike/Rachel, so I wonder why they hesitate with Donna/Harvey? I said that about Gabriel and Sarah cuz they have been like best friends for 20 years. So for them it would be like making out with a sibling haha, it would be awkward i guess. And yeah I hope they bring them together already it's been way too long!